I've had so many special days with my little Monkey since he arrived in December 2009, it's been hard to pick just one! But I decided to plump for his Christening Day - 20th June, 2010. Monkey was named after my father in law, who sadly passed away when I was nearly five months pregnant. Monkey is named after him and we picked this specific day for his Christening as it would have been his Gramps' birthday. It meant we could link him to our special day, even though he couldn't be with us in person. 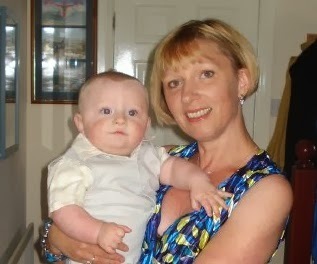 Monkey was a bit of a chunky chap back in those days, he was six months old but we had to buy him a 9-12 month Christening suit so we could do the buttons up on his shirt! But he did look smart. Mum had given me the Christening Shawl that she had used for both my brother and I, so that was draped around Monkey in his suit. I think Mum was rather gutted that we hadn't got Monkey Christened when he was smaller - she really wanted him in our Christening Gown - I wasn't so keen! My parents had flown over from Spain (where they've lived for nearly nine years) with one of their neighbours who has become a close family friend. Family had travelled from all over the country to be with us. Our special guest was my Great Auntie, I lost my beloved Granny before I'd met Daddy P, so it was wonderful for her sister to be their for Monkey's special day. It almost felt like getting married all over again, as it was rather a large gathering of family of friends. It was a glorious June day, we were so lucky with the weather. The Christening service was held in our local church. The same church where Daddy P and his mother had both been Christened, where we should have got married (but that's a whole different post!). Sadly they don't use the font any more, but they do put the Christening bowl on a beautiful stand which actually commemorates Daddy P's Mum (sadly she died before we met). 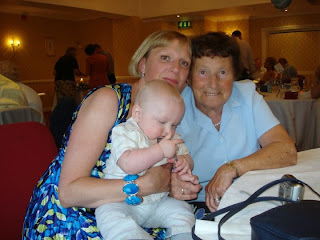 So another link for Monkey and his grandparents on his Christening Day. Monkey was so good throughout the service - no tears, no tantrums. A big sigh of relief from me. We picked two godmothers; one is my oldest friend of nearly 40 years, the other a friend who had helped me so much with all my wedding preparations and had been a real support during my pregnancy. Monkey is very lucky to have such special people in his life. After the service, we had a party at the same hotel and in the same room as we'd had our wedding reception the previous September. It was wonderful to be back, the staff were wonderful and so pleased to see Monkey replacing my bump! I'd just started weaning Monkey so he was sitting at the table with all of his guests. Again, he was so well-behaved. He was passed from one guest to another, and never moaned once. He was just a little chilled out boy, I was so proud of him. It was such a special day, very emotional for Daddy P, it was also his first Father's Day; so a day we will never forget. I just wish that Monkey would remember it, of course he won't, but we took lots of photos and had a guest book so his guests could leave him a little message for the future. 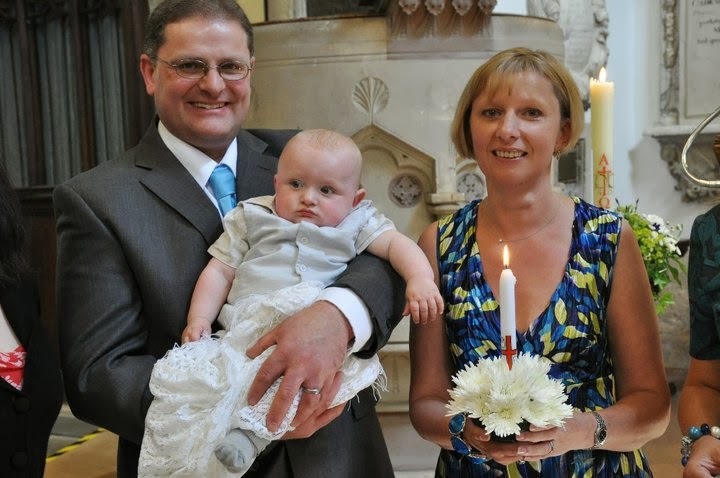 I will always remember Monkey's Christening Day, it was a magical day, with lots of special moments. I'm Mary and I blog over at Over 40 and a Mum to One about the adventures I have with my nearly four year old son. Monkey arrived just as I was planning my wedding to my second husband, Daddy P. We thought it would take forever to get pregnant, but it didn't, and I was six months pregnant on our wedding day! We live in Oxfordshire with our one year old cat Brewster, and I'm a fanatical Formula One fan, so my love of Ferrari pops up from time to time! You can also catch up with me on Twitter, Pinterest and Instagram.